Across southern California, there is a range of predicted outcomes from models of climatic change, with general predictions for the western U.S. indicating that temperatures will increase overall and there will be a general trend toward increasing variability in precipitation and an increase in drought events. Maintaining regional biodiversity and ecological function of our natural landscapes in the face of a changing climate coupled with ongoing land use development is one of the central and burgeoning issues facing land managers. In southern California, ecological networks established under California’s Natural Community Conservation Planning (NCCP) program have been developed in response to the widespread habitat fragmentation in the region. Landscape connectivity allows for movement among patches of suitable habitat, reduces the chance of extinction for small populations, maintains gene flow in patchy landscapes, and protects populations against catastrophic risks. Over longer time scales, and in the face of changing environmental conditions, connectivity will also prove critical for facilitating range shifts in response to landscape changes caused by development, changing climate, and altered disturbance regimes. In this project, we are advancing regional-scale climate-smart connectivity planning by applying cutting-edge approaches and best-practices supported by new research in ecological science. 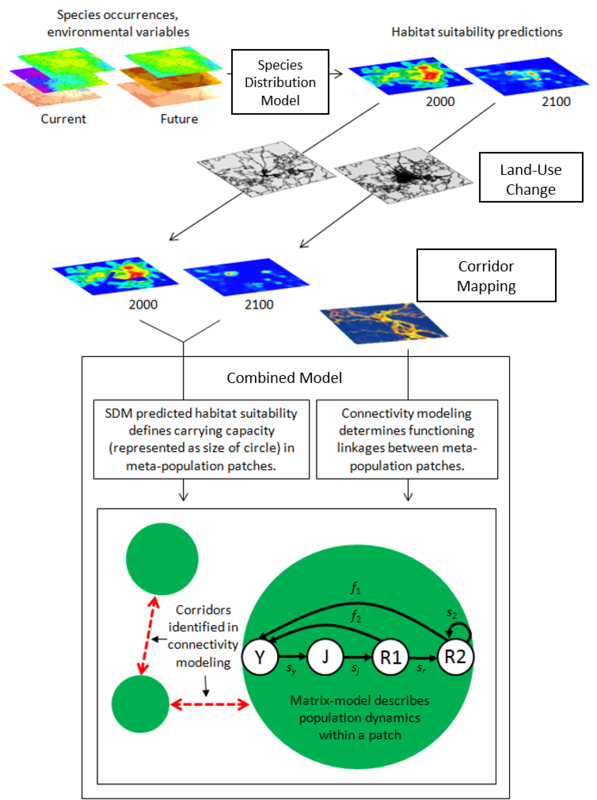 Our approach combines ensemble species distribution models (SDMs) with dynamic metapopulation models to advance connectivity modeling and planning approaches accounting for climate change, land-use shifts, and uncertainty. This novel complement of techniques has never been used before to develop a robust analysis of habitat-specific connectivity for multiple species. This project will support practical, proactive management of biodiversity under climate change by developing connectivity linkage maps for the South Coast Ecoregion based on comprehensive species and landscape analyses and mapping. ​These maps will then be used to develop an implementation guide and decision support framework to aid agencies in the identification and prioritization of land acquisition targets, land management goals, and habitat enhancement projects to protect and improve landscape linkages that will be resilient to climate change. The decision support guide will be driven by and developed through partnership with the California Department of Fish and Wildlife (Region 5), which will be implementing and managing these landscape connections, and will include actions to improve connectivity and enhance climate resiliency in the conservation network at the programmatic as well as the project level. We are currently expanding our partnership with other land management and conservation organizations at the local and regional level as well as other scientists. Funding for this work has been provided by the Wildlife Conservation Board and a State Wildlife Grant.